Bangor's guerilla artist known as "Pigeon" appears to have discovered a new canvas for his street art this year. 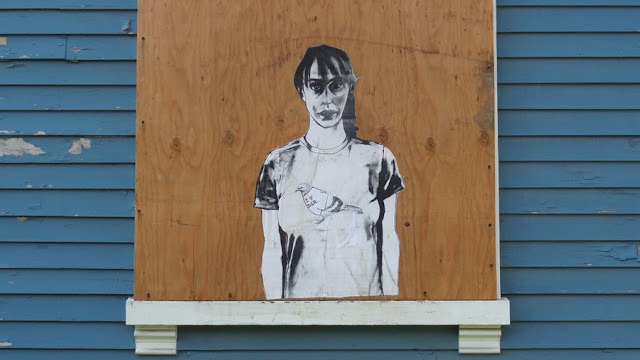 Boards used to secure abandoned and condemned properties have lately been adorned with the artist's work. Last year, pigeons wearing "I Love Bangor" shirts could be found wheatpasted on Downtown buildings. There were also seagulls, airplanes, and a multi-media display featuring shopping carts. This year, "Pigeon" has also expanded his domain to Harlem, New York where pigeons sport "I Love Harlem" shirts. With approximately 50-100 abandoned properties in Bangor (and who knows how many in Harlem), it looks like it could be a pretty busy year for the bird. I see how this works. If you don't like someones comments, you delete them. Good thinking. If you are capable of thinking that is. You must have me confused with the Bangor Daily News website.